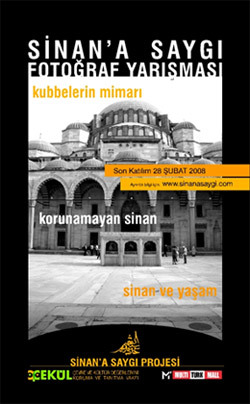 The Respect to Sinan Photograph Competition ran from 15 December 2007 to 28 February 2008 and aimed to foster greater appreciation of the life and works of the great Ottoman architect Mimar Sinan. It was inaugurated by the ÇEKÜL Foundation’s Respect to Sinan project and wanted to reflect the originality, variety and depth characterized by the works of this unique figure. With this in mind we invited entries under three categories – Sinan and Life, Sinan: at Risk, and The Architect of Domes – each highlighting different interpretations of Sinan’s rich architectural legacy. The public were invited to vote for their favourite photographs through the Respect to Sinan website, with more than 10,000 votes received between 11 and 28 March 2008. Selected works then shown in a short exhibition at Istanbul’s Hagia Sophia Museum. As well as promoting the competition in Turkish we printed posters in Bulgarian, Arabic and English and distributed them to cities across Turkey, the Middle East and the Balkans, covering all the locations where Sinan’s monuments are located. We received a fantastic response, with the photos drawing the borders of the former Ottoman Empire, from Sofia to Damascus, Istanbul to Kayseri and Edirne to Van. A total of 419 images were entered in the competition from 210 Turkish and foreign photographers. Most of the photographs were taken especially for the competition. The Respect to Sinan Photography Competition was an important step in fostering a feeling of ownership for the heritage of Sinan, which we have also tried to develop through the Respect to Sinan Trips and the Mimar Sinan Travel Maps. The Sinan and Life category invited photographers to show that Mimar Sinan’s monuments are still very much a part of everyday life for the people that live and work in their shadows. Uygar Korça’s shot of the Edirne Sultan Mosque, titled Master’s Seal, was picked as winner from the 159 entries. This category sought to highlight the all-too-common problems with architectural conservation in Turkey, the Balkans and the Middle East – one of the starting points for the entire Respect to Sinan project. Respect to Sinan aims to address the conservation issues affecting all of Sinan’s monuments and hopes to be the starting point for a wider conservation effort to protect not only 16th century Ottoman heritage but our wider architectural fabric. From the 52 entries in this category, Aydın Mızrak’s Van Hüsrev Pasha Mosque won by a large majority. Sinan’s remarkable creativity and adaptability can seen in the wide variety of structures he created – from mosques and schools to bridges and aqueducts, with a versatility and attention to detail spanning everything from huge, urban monuments to small wooden finishing details and graceful, perfectly-proportioned domes and arches. We wanted to celebrate the purely aesthetic qualities of Sinan’s eclectic architecture, and this category proved the most popular with entrants, attracting 208 submissions. Most focused on the glorious domes adorning the Süleymaniye and Selimiye mosques, two of Sinan’s most celebrated creations. Muhsin Divan’s image of the Süleymaniye Mosque, Sinan 3, came out on top. 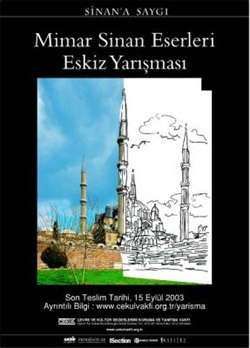 The award ceremony was held in the Hagia Sophia Museum on 27 March 2008, where ÇEKÜL Foundation Chairman Metin Sözen presented the winners of each category with a book about Turkey’s architectural heritage. An overall winner was also announced - Uygar Korça’s Master’s Seal. Mr Levent Eyüboğlu, CEO of Multi Turkmall, generous corporate sponsors of the competition, presented Uygar with flight or bus tickets plus a two-day city package to a destination where he can see more of Sinan’s works. The first exhibition of the Respect to Sinan photograph contest opened in the Hagia Sophia museum after the awards ceremony, and ran until 6 April. Selected photographs have subsequently been shown at different universities and at some of Sinan’s monuments, while a second exhibition is planned for the town of Ağırnas, birthplace of the great architect. All of the photographic entries can still be seen on this website and visitors can now also upload their on photos of Sinan’s architecture to the Your Photographs section of the site and post their own comments about Sinan’s architectural legacy. Aydın Mızrak, Metin Pala, Yasin Atayılmaz, Berrak Çelik, Ercüment Akat, Serkan Turaç, Özcan Günay, H Bahar Kaleli, Latif Dinçaslan, Erkan Yurt, Tuğba Eraydın, Okan Yılmaz, ibrahim Bozbıyık, Claudio Tortorelli, Serkan Yetgin, Salih Yılmaz, Bahri Sevindik, Muhsin Divan, Luca Orlandi, Haluk Sargın, Mesut Kaplan, Alekos Stamoulos, Ayhan Altun, Berkcan Okar, Erkut Erkek, Eva Stamoulou, Mustafa Özden, Muzaffer Özgüleş, Nezihe Esen Gök, Uygar Korça, Murat Şen, Mehmet Karabulut, Gökmen Kanberolu, Luca Orlandi, Stefan Zlatanov, Sena Özfiliz, Şehri Kartal, İ Gültekin Alkurt, H Şenay Yılmaz, Serkan Turaç, Cihan Aldık.